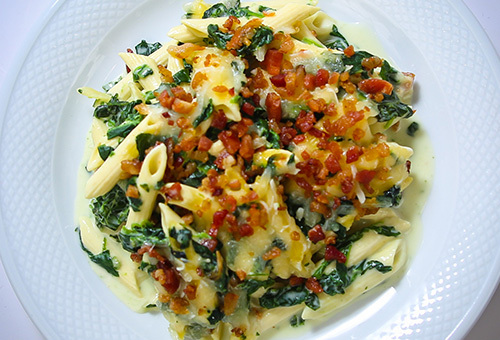 Classic flavors come together to make a sensational weeknight meal. 2. Add Alfredo sauce, spinach, milk and water. Stir until well blended. 3. Pour uncooked pasta into dish and stir to coat evenly. Bake 15 minutes uncovered. 4. Remove from oven and stir thoroughly. Top with mozzarella cheese and bacon, if desired.